Brazilian equity market experienced a significant pullback during the month of May due to political concerns. The correction amounted to being the worst one-day drop since Dec. 30, 2009. On May 18, 2017 alone, S&P Brazil BMI dropped 8.85%. On the same day, the S&P/BOVESPA Low Volatility Index posted -5.72%, over 300 bps less than the underlying market-cap-weighted index. The lower losses posted by low risk indices are not surprising. It is well established that low volatility strategies deliver higher risk-adjusted returns than the broad-based, market-cap-weighted benchmark over a long-term investment horizon. Low volatility strategies tend to go down less than the market, thereby offering downside protection while providing a degree of upside participation in an up market. The efficacy of the strategy has been demonstrated not only in developed markets, but also in Brazil. Brazilian market participants concerned about equity market volatility can express their views through low volatility strategies. 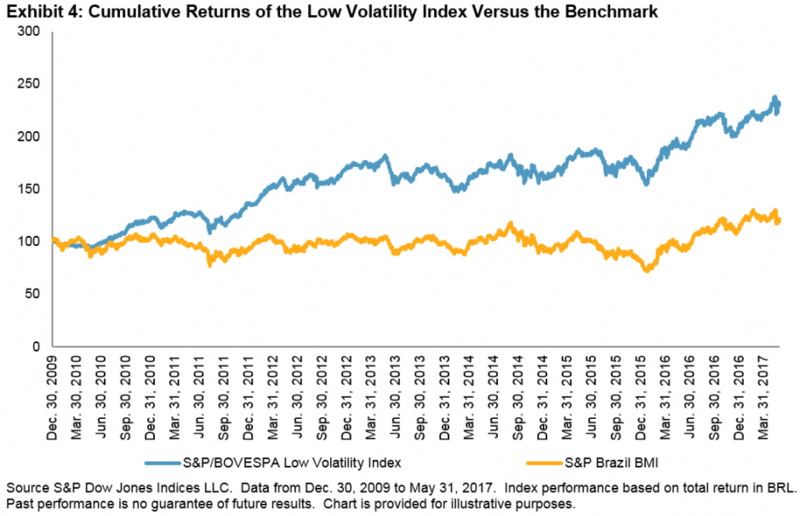 The S&P/BOVESPA Low Volatility Index, launched on April 30, 2015, is designed to track the performance of the top quartile of securities in the Brazilian equity market that have the lowest volatility. Exhibit 1 and Exhibit 2 highlight the performance of the S&P/BOVESPA Low Volatility Index compared to the underlying market during the month of May. While the underlying broad market posted -3.74% (TR), the low volatility strategy experienced positive returns of 1.04%, delivering nearly 480 bps of excess returns. The behavior of the S&P/BOVESPA Low Volatility Index compared with the underlying benchmark is not exclusive to just May 2017; we have similarly observed lower drawdowns than the market through time. 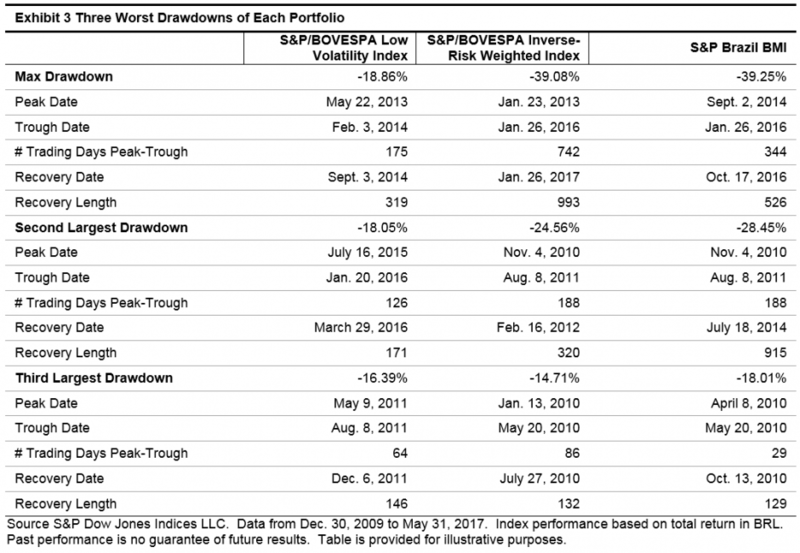 Exhibit 3 shows the three worst drawdowns during the index history, from Dec. 30, 2009 to May 31, 2017. In all three cases, the low risk strategy posted lower losses than the market. Because they experience lower drawdowns than the underlying market, low volatility strategies generally have less to make up for on the upside. Therefore, over a long-term investment horizon, low volatility strategies tend to deliver higher returns than the benchmark. We observe the same effect in Brazil, with the S&P/BOVESPA Low Volatility Index outperforming the benchmark (see Exhibit 4).